Hoping someone can explain why this is happening, so that I may understand, learn, and make a better antenna. A few weeks ago I ran a 60 foot long wire antenna, 25 feet vertical and 35 feet sloping from the pole to a terminating point in the yard. The mast is ~18 feet of galvanized fence post - the top is PVC. The PVC top has a small screw eye to channel the wire. The wire runs straight up, then slopes down to a point in the hard. The wire is 24 AWG single pair cross connect wire – connected together at the spool end. The wire spool is simply hung at the wall with about 20-30 feet coiled in the spool. The antenna was clipped to the RTL-SDR V3 antenna base without the telescoping whip – alligator clipped to the threaded mast. The base sat on the tile floor. Using the q-branch in SDRSharp, I had broadcast AM overload everywhere throughout the q-branch range. Even on a BC AM frequency, I had overload from other stations. It was horrible. Unusable. The antenna in its current configuration simply did not work. Compared to a 25 foot long wire thrown over my neighbors tree, the 60 foot long wire was useless. The 25 footer worked well but I thought I could do better. I bought a Noelec 9:1 balun. If I connect both ends to the balun, one wire to each terminal, signal drops to near zero. WWV at 10.000MHZ is strong and audible with one wire and drops no near-no signal and becomes inaudible with both wires connected to the balun. When connecting the second wire to house ground (electrical wall plate ground) the BC AM overload comes roaring back. It went back to heavy overload like it was just clipped to the antenna base without the balun. If I connect a second 25 foot wire to the second balun port, the signal improves a bit – more than just the single 60 FT wire connected to a single terminal. To summarize, using a 60 FT wire, without the Noelec 9:1 balun, BC AM overload is everywhere. The balun with one wire connected, BC AM overload is suppressed. Connecting the second leg of the pair to electrical ground brings back BC AM overload. Connecting a 25 FT length of wire running to the second port of the balun seems to improve signal – as if the 25 FT wire compliments the 60 FT wire for improved tuning. Perhaps a ground plane? 1) What is the balun doing that suppresses BC AM overload? 2) Why does BC AM overload occur when connecting one of the two wires to an electrical ground? 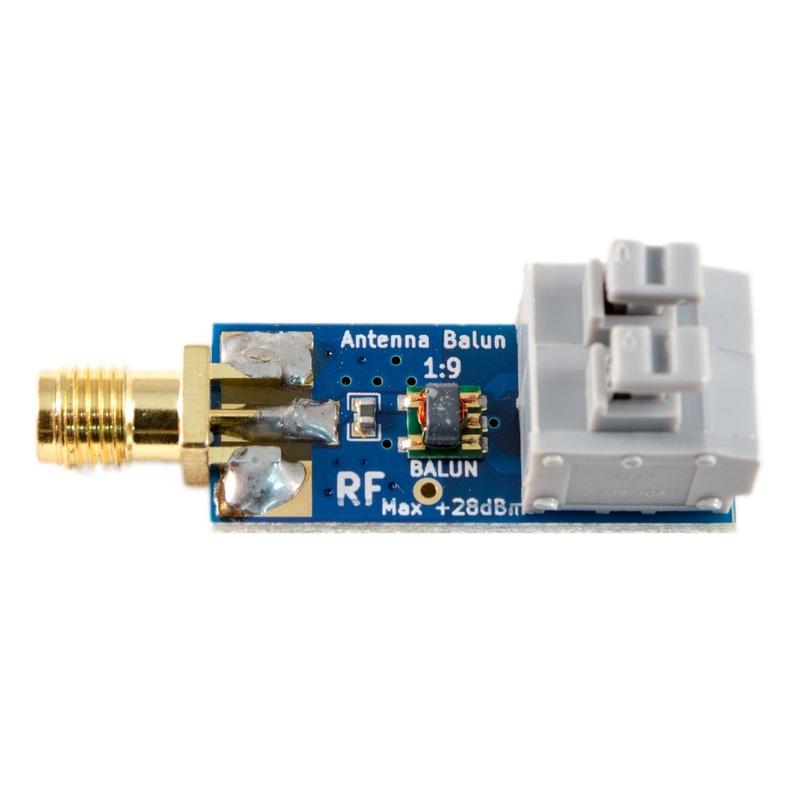 3) Why does signal disappear when connecting both wires to the balun (one to each wire port)? 4) What is the second wire, running in a different direction, doing to improve performance over the single 60 FT wire? 5) Will a ground improve performance, if yes, how do I ground the antenna and/or RTL-SDR V3? When reading your message I was totally confused which "wires" you did connect to what. But I try to visualize what you did. When your balun (which is in fact an unun for a longwire) suppresses overload it must be connected wrong. A properly connected unun increases signal strengths which contributes to overload on a receiver which is not very immune against intermodulation. Unfortunately the RTL dongles do not withstand strong signals very well. An unun connected wrong decreases signals and the RTL has less overload. Your longwire needs a counterpoise. This is the ground. I hope you used a good ground (steel water pipes, lightning protector, rods driven into the ground, not a "ground" from your electric installation in the house). As the signals increase your RTL overloads. Sorry, I do not understand what you did here. Which wires to which ports? I only can imagine that you connected two parallel wires to the input ports of the unun. Then both signals coming from the wires are overimposed phase-reverted which results in theoretically null signal. Both signals "kill" each other. The second leg is the "counterpoise". You have tried to build an FD4 antenna which is no bad solution at all. But for a "real" FD4 the RF transformer should have 4:1 or as some say 2:1 when the height above ground is small. And the length of the legs must match. But we are speaking about longwires here, not about an FD4. Yes, it's absolutely necessary. I have attached a sketch of my 25 m wire antenna. The ground should be a "good" ground as I mentioned above, not a "ground" connection from an outlet in the wall or similar. House electrics carry too much noise. The current baluns may be obsolete when you live in a low noise environment. They help me to suppress common mode noise travelling either from my house to the antenna or from the coaxial cable to my receiver. When one wire of the twisted pair is connected to the upper terminal, the signal strength is good. When the second wire in the pair is connected to the lower terminal, the signal practically disappears. The balun is connected via SMA barrel connector to the antenna input. In the same situation, if I keep one of the twisted pair wires connected to the upper terminal, and I 'ground' the second wire to the house ground, BC AM is present. Ultravista - As Danube said, the two connections input connections on the balun form a 'differential' input. If you put the same signal on each end, they will cancel and there will be no output. Obviously a pair of wires twisted together are picking up the same signal so they should not be connected to the balun like that. A single wire antenna should go to one clip and an earth (ground) connection to the other. Then it will work. If you are having overload problems, have you tried turning off the LNA or turning down the gain? BTW, SDRPlay do not recommend the use of the SMA inputs for frequencies below 1.5 MHz. The Hi-z input has better performance on MW, LW and LF. There's an illustration of how to make the connections somewhere on this site. Basically, connect your wire antenna to either the P or N tag, and the earth to G.
Hi Heinrich. Very appreciated your sketch. Can you please share some details? CaptainNemo wrote: Can you please share some details? Annotation: The current baluns may be obsolete when your environment is not noisy. In my case the left current balun (next to the unun) has turned out to be useless after I grounded the coaxial cable shield at the foot of the mast. This was enough to prevent noise picked up by the coaxial cable from travelling to the antenna. BTW: You can also use a wooden pole here. But the coax cable shield should be grounded at the bottom. The current balun next to the receiver is a must for me for any antenna. Unfortunately my PCs, monitors, switched power supplies (even badly shielded USB cables, I could not believe this) induce noise into the caxial cable. I have also seen fotovoltaic inverters from my neighbours inducing noise (magnetically) into my coaxial cables via the open power lines which we still have "in the air" here. That means: The noise is even there when there is no antenna connected or when the far end of the coaxial cable is terminated with only a 50 Ohms resistor! The current balun at the receiver suppresses this noise effectively. But for the noise going directly into the antenna itself there is no remedy. And this becomes more and more almost weekly. The actual consumer electronics in the houses do not care of de-noising any more. And they even do this with legal approvement. The authorities do not care. And then there are these homeplug PLC modems in the houses. A nightmare. You can put as many efforts into your equipment as you want. You cannot get rid of their high broadband noise. for safety reason (an not to quarrel with neighborhood) I can't raise poles more than let say 3m height. When you only have room for 3 m poles you should inform yourselves about EWE antennas. But EWEs are directional and work best for MW and lower SW bands. Have you ever tried wideband magnetic loop antennas? I use several of them with homemade amplifiers according to LZ1AQ. He also sells very cheap but excellent kits. You can build good wideband antennas with a ring or wire loop which are very small, appr. 1 m ... 1.5 m in diameter (or bigger if you have the space).